Add some white and gold beauty to your next Halloween costume, take your little angels trick-or-treating for some delicious Halloween candy, or get an outfit that's perfect for a church service, a religious performance, and more when you shop for Angel Costumes, available for kids and adults. You can also find accessories like wings, halos, and harps! When there is an entire room of monsters, ghouls and bad guys, it is nice to be the beacon of light. Showcasing all the good there is in the world, you will be wearing the most beautiful costume at your next get-together when you dress up like an angel. Angels are the guardians of hope and wonder, the keepers of magic and dreams. They are there to protect and always watch over those in need. Whether your path has been pure or you have run into a few bumps along the road, your kind heart and gentle soul will fit perfectly with this angelic costume this year. As the purist souls around, children are well suited to be dressed up as the little angels they are. Their silly giggles are certainly a gift from the heavens and those brilliant smiles are free of any ulterior motives. Dress your baby as your little angel for the next costume party. Not all angels fly along the path of brilliant white light. Whether they have fallen or simply taken a different path, some angels prefer the darkness. They still hold the same magic and undeniable power, but an angel of darkness isn't innocent by any means. Have a little bit of fun in your own angel of darkness costume and let go of "right" and "wrong." Angels are always all around us. In each drop of rain and every stranger's handshake. Be the vision of all that is good with a classic angel costume that is everything you invision when you think of an angel. Shake things up for this costume party with a dark desire angel costume. Nothing is quite as tempting as turning from the side of light and innocence to the lustful side of darkness. Be a little more daring and fall off the golden path for a night. Angels aren't good because they get rewarded, but they are rewarded because they are good. Get a taste for what is feels like to live in the soft embrace of the heavens with all the riches you could imagine. 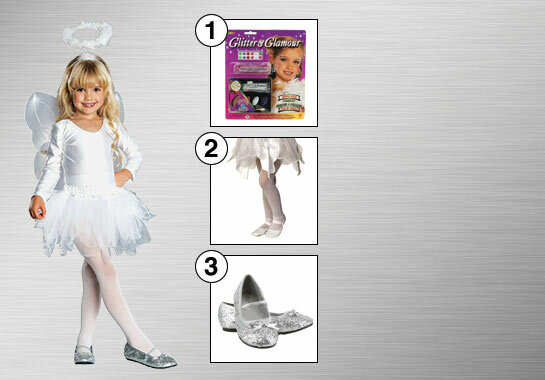 You will have it all in this glamorous angel costume that is sure to drop jaws. Not all angels come in human form. Whether it is a drop of rain, a ray of sun or a puppy dog's gentle kiss, mother nature is an angel's favorite hiding place. 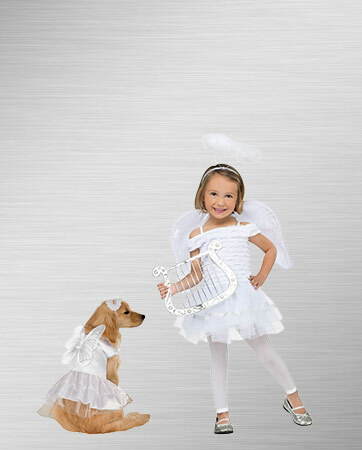 Include your furry little angel in this year's family costume and give him his own pair of wings. The ultimate battle. Every story line features good versus evil, and it is a constant struggle in the real world every day. Split your group down the middle in a battle for the ages. With one half fighting for the light and the other half reveling in the darkness, the stakes will be high. Whether you gather together friends or family, everyone will get a kick out of which side each person chooses. Maybe someone will even unexpectedly switch sides! Which will you choose? You must reap what you sow. In this pair pair of matching costumes, you can do both with your best friend. Pit good verse evil and life verse death. Be the angel and grim reaper wherever you go. The apple doesn't fall far from the tree. Both mother and baby will look heavenly in these angelic costumes. The only accessory you need is your glowing smile and then the perfect costume will be complete. Every angel needs a friend. Let your little girl dress up her sidekick for your next costume party. The two angels will look heavenly once they earn their wings and halos. Good always prevails. While it may feel like an eternity, the light always shines through in the end. When you battle fairly and for peace and justice, the heavens will come to your aid. Fight for what is true and pure as the ultimate personification of good. An angel embodies everything that is pure in the world. You will play more than just the devil's advocate in this mischievous costume. Be the devil himself and play the role of the ultimate evil. With darkness on your side, you will be constantly trying to lure everyone else away from the light. With your sneaky ways, make your way around the party. Keep an eye on the angel who is determined to make you change your ways. Not every angel wants to be 100 percent good 100 percent of the time. Play the fine line between good and bad with a sultry dark angel costume that is sure to turn heads. You will be the answer to everyone's dreams, but that doesn't mean you have to play by the rules. This costume lets you show your wild side with a daring embroidered bodice top and satin shimmer dress. The organza and chiffon wings command the attention of the room with faux feathers that let you soar above all the rest. Your matching silver halo will leave no doubt in their minds, assuring them all that you truly did fall from heaven just to grace them with your presence. You will be the picture of perfection as you shine brightly with this highly coveted glitter makeup kit. Enhancing your beautiful features will allow you to walk with confidence through the party both day and night. Add some fun glitz and glamour to your look while still keeping your air of innocence and purity. Shine from head to tow with the bright white light of the heavens. You will look out of this world with sparkling tights that give you a majestic touch. Angels are magical creatures so you should look the part. These extraordinary tights are subtle but very necessary for completing the overall look. Your wings may make you fly, but these shoes will make you soar. You will quickly fall in love with these shimmering ballet flats. You will stay comfortable all day and night, whether you are dancing or spreading joy to all of your friends.